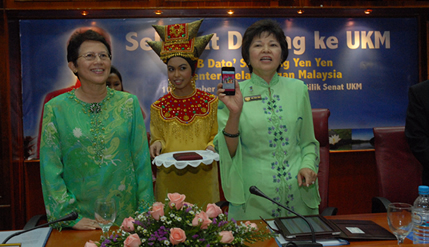 BANGI, 10 Nov. 2010 – The tourism sector in the country can expand with the knowledge eco tourism concept introduced by Universiti Kebangsaan Malaysia (UKM), said Tourism Minister Dato’ Sri Dr Ng Yen Yen here today. She said the conventional understanding of tourism would invariably refer to the beauty of nature, arts and culture, historical artifacts and heritage. But the tourism sector can be developed further through the promotion of knowledge eco tourism introduced by UKM, she said in her speech after a briefing by UKM Vice Chancellor Prof Tan Sri Dato’ Dr Sharifah Hapsah Syed Hasan Shahabudin, in conjunction with her working visit to UKM, here. She said the tourism sector must be developed and expanded further to meet the challenges of the Government’s pursuit for a new economic model to ensure that the rakyat have high incomes. Though knowledge can be acquired from books or journals but the world outside are also sources of knowledge that could be generated and promoted. She said the briefing by Prof Sharifah Hapsah has made others aware, especially those directly involved in the tourism industry, that the tourists of today are different from a few decades ago, in that they have different expectations and needs. With increasing educational level among the tourists, especially those from the West, they would want to know the stories or what is behind the beauty or uniqueness of tourist attractions like Tasik Cini, Lata Jarum, Bukit Fraser, Mersing, Pulau Langkawi and so on. Dr Ng also said she is happy with UKM for undertaking intensive measures to restore and preserve several areas with high tourism potential. She urged other institutions of higher learning to be more active in undertaking academic activities that could project the uniqueness of Malaysia and attract participation from all corners of the world. Her ministry, she said, would directly support all knowledge-based activities that could project Malaysia as a knowledge destination for tourists. “We want to see more tourists coming to Malaysia not just for its beauty and uniqueness but also for things produced from the thinking of her people which they want to learn about,” she added. Earlier, Prof Sharifah Hapsah, in her briefing, said UKM has seven research stations which are open to visitors who can arrange their tours through a travel agency, K Eco Tourism Sdn Bhd. Six of the stations are outside the university — the Tasik Cini Research Centre (Pahang), the Fraser’s Hill Research Centre (Pahang), the Langkawi Geopark Research Centre (Kedah), the Mersing Marine Ecosystem Research Centre (Johor), the Lata Jarum Recreational Forest Research Centre (Pahang) and the Sungai Pulai Research Station (Johore), while the one within the campus is the Bangi Permanent Forest Reserve. Visits can also be arranged to the Cultural Centre of Students’ Service Department, the Academic Heritage Museum, and the Technological Innovation and Green Energy Centre in UKM. All the tour packages would enable visitors to know more about the eco-systems, the trees and plants, culture of the people as well as their uses or values to society.